These Chinese Christians refuse to obey the government over God. Rather, they commit to 'faithful disobedience.' Read on. Pray. Be inspired. 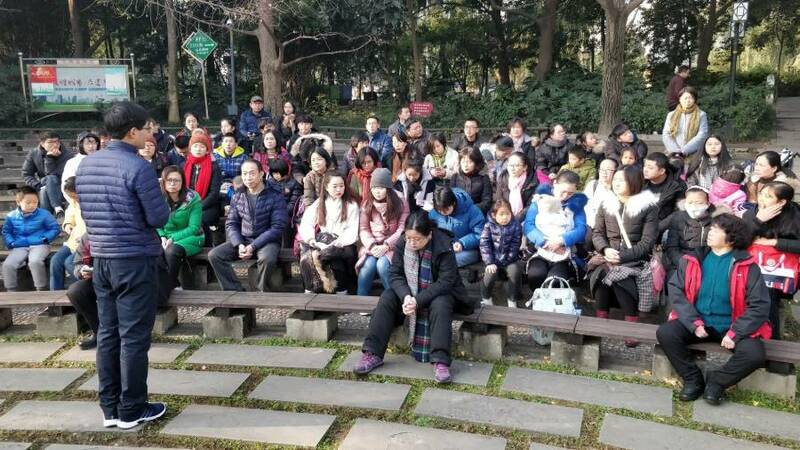 After police banned this church from meeting and locked their church building, members from Early Rain Covenant Church in China still gathered for corporate worship last Sunday, Dec. 16. More than 60 were arrested. Some met outside, as pictured here. Chinese Christians are standing steadfast against the government’s attempts to make itself greater than God. The Chinese government wants to control every aspect of society, including how its people worship God. But believers in Jesus are willing to disobey immoral laws. They’re willing to suffer the consequences to show their persecutors and fellow citizens that God is the ultimate authority and source of hope. One Chinese church, Early Rain Covenant Church, came under harsh persecution from police last week. Their Facebook page, Pray for Early Rain Covenant Church, has documented the persecution with images, videos, prayer updates and links to media coverage. I’m thankful God has given us this look into the faith of our modern-day persecuted brothers and sisters in Christ. The following five posts are a beautiful display of the heart of this church. I hope reading them will inspire us to pray and have their same commitment to Jesus above all else. Before you dive in, here’s some context. Members of Early Rain Covenant Church, also known simply as Early Rain, have faced pointed persecution. The latest round started on Dec. 9. More than 100 church members and church-affiliated university students were detained. Some have since been deported away from the church to their hometowns or kept under watch at their homes. As of the church’s last prayer update, posted Dec. 18, 16 members are known to be in detention, and four have been missing for more than a week. Their church was declared banned, or officially shut down, for being unregistered with the government. The church’s Facebook page reported various forms of persecution against church members. According to these reports, police have rounded them up from homes, detained them in police stations, and physically assaulted them. Police have told them to sign pledges that they would only attend state-sanctioned churches. And forbade them from meeting in their church. Police have followed them when they leave home and arrested them for visiting other church members in their homes. Most recently, the church posted a video of several moving trucks outside their church building. They say everything is locked up and boxed up. Since government officials declared Early Rain banned, 60 police officers raided another Chinese megachurch and also banned it, confiscating church books and other property. This raid of Rongguili Church, which attracts up to 5,000 worshipers a week, marked China’s third shutdown of a megachurch since September. This still doesn’t tell the bigger story of recent Chinese persecution of Christians. Bob Fu, Founder and CEO of ChinaAid.org, said the attack on Early Rain is “the tip of the iceberg” of President Xi Jinping’s religious persecution. “According to our own accounts, this year alone, we have estimated over 100,000 arrests of Christians and Catholics,” Fu said in an interview with CNN. In the face of this mass persecution of the church in China, Early Rain’s pastor has taught his congregation what to do. The senior pastor, Wang Yi, was formerly a constitutional lawyer and human rights activist. He has studied the battle he’s up against. Wang’s “My Declaration of Faithful Obedience,” was published after his arrest last week. It has since been translated into four languages, touching readers across the globe. “The goal of disobedience is not to change the world but to testify about another world,” Wang wrote. Armored with leadership from Pastor Wang and power from the Holy Spirit, Early Rain members have been beautifully displaying their faith in these past days of persecution. Here are Five of Early Rain’s Best Facebook Posts. These posts illustrate the heart of Early Rain Covenant Church as its members face persecution. On Sunday Worshipers Met Without Their Church Building. 60 Were Rounded Up. Members of Early Rain Covenant Church worshipped together outside this Lord’s Day after authorities banned and closed their church, detained over 100 of their members, and imprisoned more than a dozen of their leaders on criminal charges including “incitement to subvert state power,” “stirring up trouble,” and “illegal business operations.” Over thirty more members were detained this Lord’s Day, and many others were not allowed to leave their homes, with police guarding their doors.